Capsule Summary: The 4077th celebrates an impending ceasefire but Trapper doesn’t believe the fighting will actually stop. I have only one complaint about this episode and it really doesn’t have anything to do with the episode itself. “Ceasefire” was the final episode to guest star Marcia Strassman as Margie Cutler. Margie was my favorite recurring character from Season 1 and also my favorite nurse featured on M*A*S*H. I can’t say I’m particularly fond of her haircut in this episode but that’s beside the point. I’ve always wondered why Strassman didn’t return in Season 2. The simplest explanation is that the writers didn’t want a recurring love interest for Hawkeye. Actually, I have one other criticism. It’s painfully obvious the entire episode was filmed on the Stage 9 sound stage and not outside at the Fox Ranch. Unfortunately, the script called for numerous shots of people celebrating outside. Because filming was restricted to the sound stage, the parade circling the Swamp looks very cramped–almost comical, in fact. As with most episodes, if we look too closely at “Ceasefire” it’s pretty easy to find things to pick at. For example, is it believable that out of everyone at the 4077th, Trapper is the only one to exhibit any skepticism about the ceasefire? Likewise, what are the odds casualties would arrive seconds after General Clayton announced there was no ceasefire? Finally, how did Hawkeye manage to get all those pictures of Margaret and General Clayton? The two are clearly posing for the camera. There’s quite a lot going on in the episode. 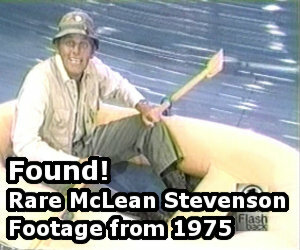 I like Trapper’s storyline the best. Unwilling to celebrate the ceasefire because he’s convinced it either won’t happen or won’t last, he offers a nice counterpoint to Hawkeye and the rest of the camp. Thanks to some fine work from Wayne Rogers, Trapper doesn’t come across as a killjoy or a whiner. He’s a realist resigned to the fact that ceasefires don’t mean anything until they actually happen. Hawkeye’s romance storyline is a little too silly. I don’t think we really got the impression earlier in Season 1 that he was in serious relationships with multiple nurses. I suppose one nurse could’ve gotten the mistaken impression the two had a future together after the war. But three? I like the idea of Radar wanting a scrapbook but the execution falls a little flat. He’s insulted by the notes Trapper and Hawkeye leave but loves the one Colonel Blake leaves. 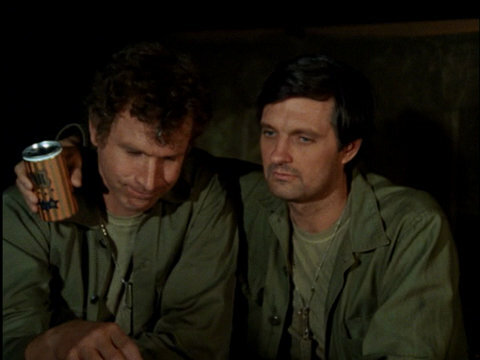 That’s a nice moment ruined by an awkward scene in which Radar more or less begs Colonel Blake to keep in touch once they’re both back in the States. For whatever reason, Blake doesn’t want to but Radar keeps asking. Either I hadn’t seen this episode in so long I’d forgotten parts of it or the scene in which Margaret sticks her head in the stove was cut in syndication because I didn’t remember it at all. The Margaret/Frank storyline is fine but it’s too bad they’re cut off from the rest of the camp. Klinger selling his dresses is harmless filler. I’m surprised Colonel Blake doesn’t get his own storyline. He’s involved in setting up the ceasefire plot and Radar’s storyline. His speech about returning home and enjoying everything about civilian life is a good one. Father Mulcahy’s impromptu speech standing in the jeep is nice, too. Trapper and Hawkeye hear the disappointing news. Finally, Gelbart confirmed in February 2008 that “Ceasefire” was not written with the expectation that it might be used as a series finale due to low ratings. Is it Hawkeye who pours beer on Trapper while everyone sings “Auld Lang Syne” or are we watching Alan Alda pour beer on Wayne Rogers? Watch closely and you can see Rogers say something and then he and Alda start laughing. This was the last episode to feature Patrick Adiarte as Ho-Jon. Also, although Lynnette Mettey later played three different nurses in three different episodes, “Ceasefire” was the final episode in which she played Lt. Nancy Griffin. The Internet Movie Database claims that Bonnie Jones makes an uncredited appearance in “Dear Mildred” but I don’t think that’s true. So “Ceasefire” is her last episode as well. Odessa Cleveland gets a credit for this episode and Ginger is in the O.R. scene at the beginning but unless I missed it she doesn’t say anything. Perhaps a line was cut? Certainly not one of the best episodes of the entire series, but at the same time it is a personal favorite of mine because of the rare opportunity to see Trapper shine. This may be Wayne Rogers best work of the series (not dissing other popular Trapper episodes such as Kim, I just really like his performance in this one). I thought an alternate version of this episode was written in case the series wasn’t renewed for another season – I’ve heard that for years, but I guess that was just another one of those urban legends that has been floating around for years if Larry Gelbart says otherwise. As for Cutler, she clearly was a victim of the retool for Season 2 where the producers dropped many of the recurring characters from Season 1, including Barbara Bannerman, Ugly John, Ho-Jon, and others; really, only Klinger, Mulcahy, and Ginger stuck around. The only time I remember seeing this episode was in April 1982, as I watched from my hospital bed recovering from a car accident. If I remember right, it was a late-afternoon rerun. Ken Levine has written in his blog that MASH episodes produced late in a season, after reverting from Daylight Saving time to Standard time, had to be filmed entirely indoors because of lack of daylight during late fall/winter months. Since this episode was produced second-to-last in Season 1, and Gelbart mentioned that this episode was filmed at the start of the Jan. 1973 ceasefire in Vietnam, the lack of daylight was the most likely reason for no location shooting for this episode.